My 17 gallon tank which housed Altolamprologus compressiceps sp. ‘Sumbu Shell’ and Neolamprologus multifasciatus. “Why don’t your tanks look like the ones in online photos?” my wife said. ‘”My tanks are not show tanks. They are breeding tanks. I keep them minimalistic to save cleaning efforts” I replied. I could feel the tension building up. I quickly had to come up with an answer so that she won’t order me to move my rack which holds about 14 10-gallon breeding tanks, to somewhere else. I hesitantly said, “Why don’t I make a show tank for you that would be more of a decoration for our apartment”. She was not ready to have “another one” in the house but I finally convinced her. So, I had a new project; a project to build a show tank with some elegant, colorful and rare fish. This tank also had to be accompanied by a “live wall” or “living wall” that would hold air plants, orchids, ferns, and other tropical plant forms. After a few alterations, it finally came down to creating a Lake Tanganyika biotope-like tank. I have prior experience working with Tanganyikan cichlids and that experience helped me immensely in planning this project. I wanted two types of fishes: a bottom-dwelling species, and a rock dwelling species. I had very specific requirements about the species in particular. I wanted Trematocara variabile and Paracyprichromis nigripinnis. I will focus specifically about the latter species first and will share more about the creation of my living wall and my experiences with Trematocara variabile in future blog posts. 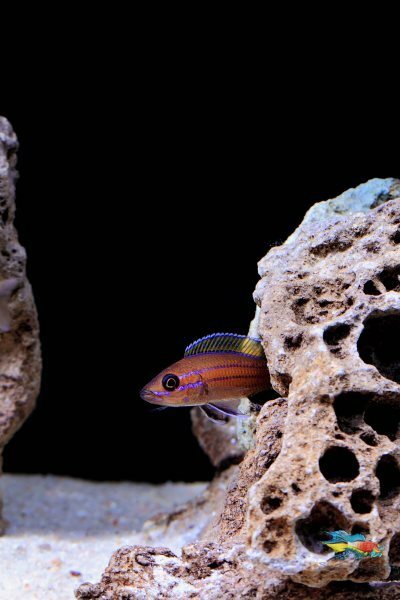 I also considered Cyprichromis species for my tank. After reading about both genera, I found out that Paracyprichromis and Cyprichromis both genus fall under the same tribe Cyprichromini (tribe is a level above genus but below a family). Cyprichromis are more of an open water fish than a rock-loving fish. They grow bigger than Paracyprichromis and would need more space than I had to offer (my tank is an ADA 90P with dimensions of roughly 36″x18″x18″, holding approximately 50 US-gallons / 189 L). 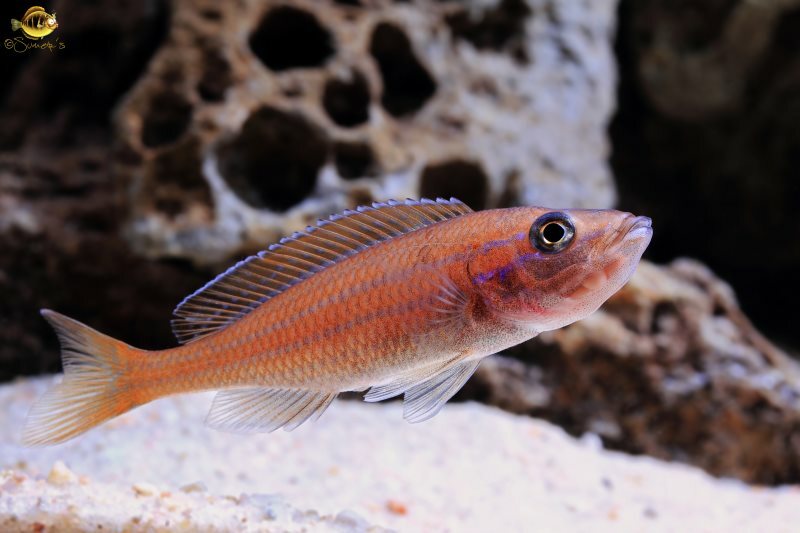 Unlike their Cyprichromis relatives, Paracyprichromis like to stay near the rocks and don’t necessarily go out in shoals. They are smaller than Cyprichromis and a little less aggressive too. 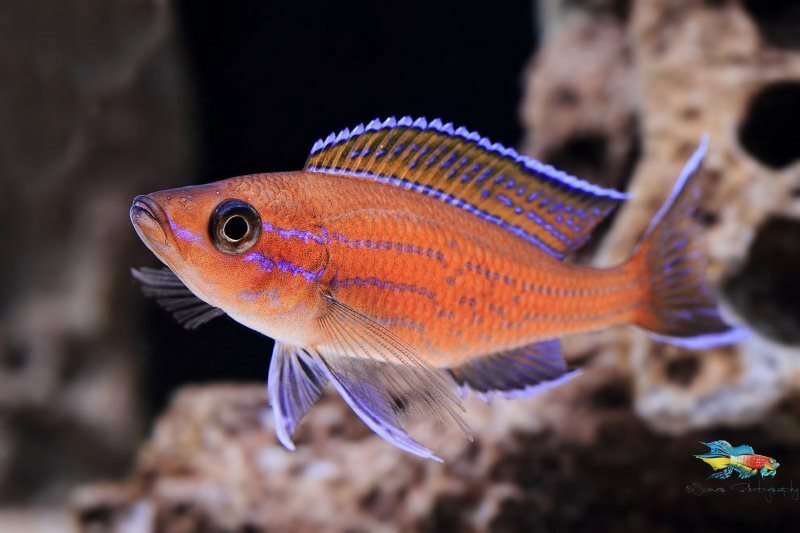 Paracyprichromis nigripinnis ‘Chituta Bay’ male. They have bright purple color on the fins, tail and the body. Paracyprichromis nigripinnis ‘Chituta Bay’ female. They don’t possess shiny colors of the males but that doesn’t make them any less beautiful. 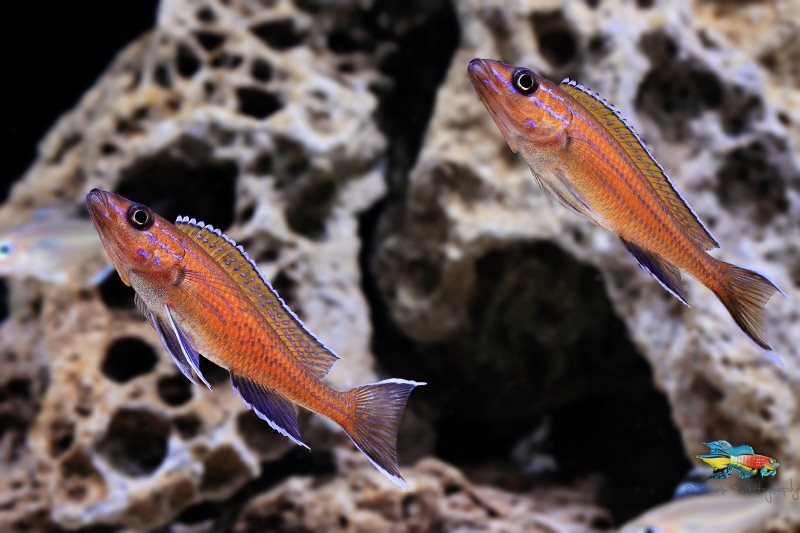 Based on the location of their origin, there are a few variations of Paracyprichromis nigripinnis available in the hobby. There is also an albino version which can’t be attributed to any specific wild population. Hobbyists are usually advised to keep only one kind of variants to keep the species from losing its original form. When it came to buying these fish, I went with SouthEast Cichlids. 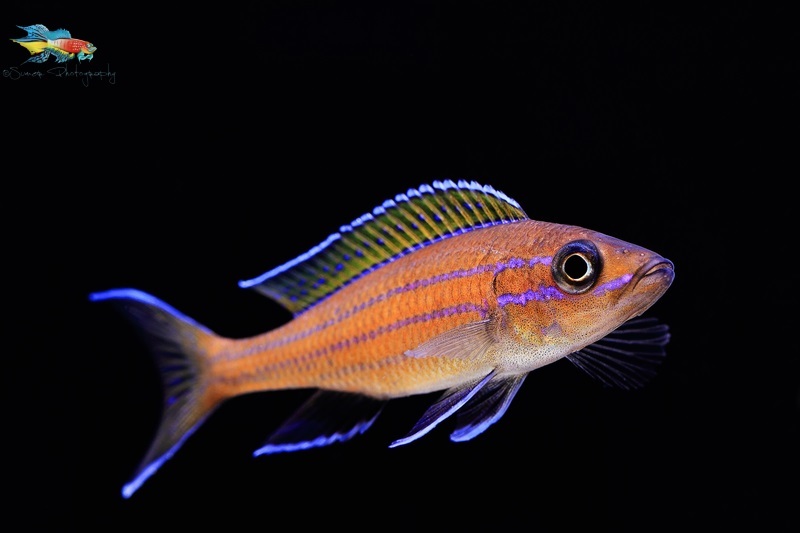 They were offering Paracyprichromis nigripinnis ‘Chituta Bay’. I ordered 6 specimen (2 males and 4 females) that they imported from the breeders in Germany. More captive bred fish in the hobby means less impact on the wild population. Paracyprichromis nigripinnis ‘Chituta Bay’ male flaring. You can see the tail portion of the body is bent in the upward direction. My tank was cycled and ready. 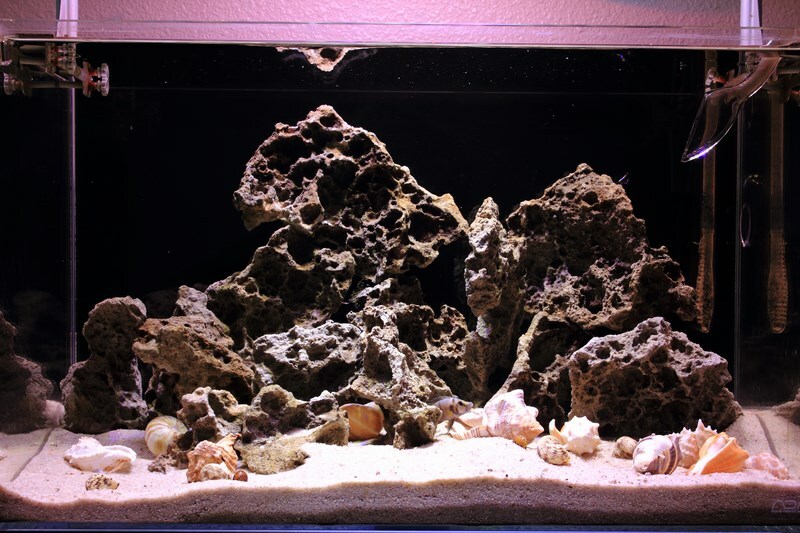 I used lace rocks to build the layout. I made sure there was enough surface area on the rocks for all six of Paracyprichromis nigripinnis. The temperature was kept at 76F (24C), the pH was at 8.1 and TDS was at about 400 ppm. 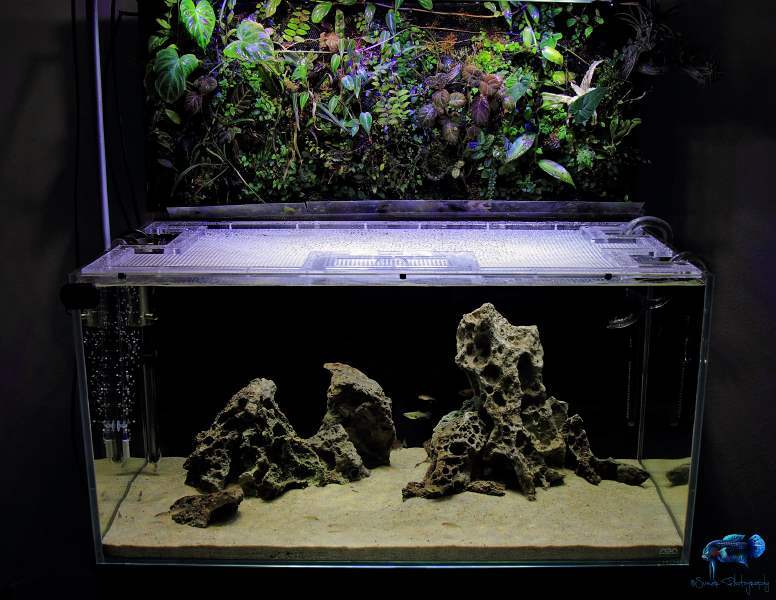 A view of the display aquarium and its live wall. The female Guppies in the photo were added at the beginning of the project to cycle the tank but I could never take them out. Catching female Guppies in a tank full of lace rocks is no joke. The custom acrylic top was made by my friend Adam. It helped a lot in keeping the fish from committing suicide. I tried DIY-ing a camera slider. The video below was shot on that slider. It was so sophisticated that it used cooking oil on the conduits to make the camera slide (pun intended). I am not sure if it worked like I had expected but hey, I still get 50% points for my attempt. Once the fish were settled in, I started feeding them with New Life Spectrum’s Cichlid Formula pellet food. I noticed that they would eat it while the food was in the water column, but as soon as it hit the bottom, they would lose interest and failed to eat it from the bottom. Looking at their behavior, I tried different kinds of food that would stay in the water column longer before sinking to the bottom. Flake food is really good at staying in the water column for a long time but it is hard to find good quality flake food. After a lot of research, I found that Brine Shrimp Direct makes some premium quality flake foods. I selected their “Mysis Diet enriched with SELCO” flakes. Both, Trematocara variabile and Paracyprichromis nigripinnis loved it. I also kept feeding frozen bloodworms and brine shrimp as treats occasionally. Similarly, in this project as well, Paracyprichromis males started harassing my Trematocara variabile group over territory and food. 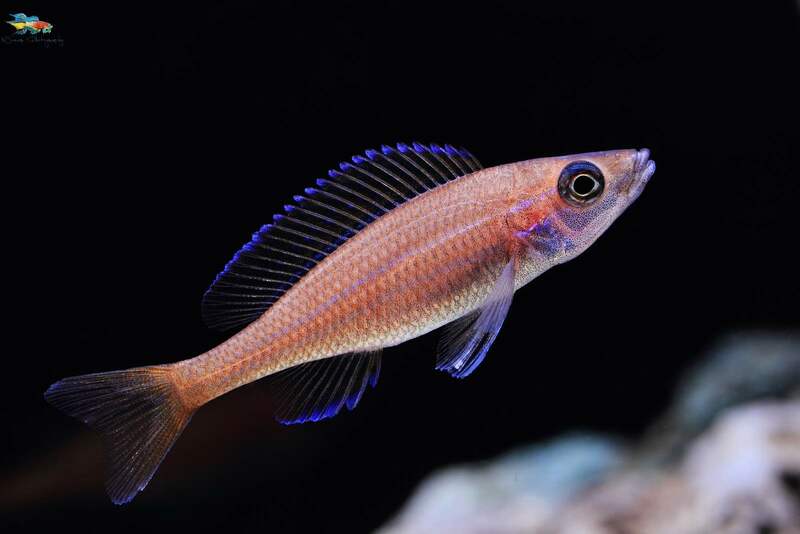 I knew it was time to say adios to the Paracyprichromis nigripinnis group. Two Paracyprichromis nigripinnis ‘Chituta Bay’ males sparring with each other. Little did I know that the aggression might have been due to the fact that Paracyprichromis nigripinnis group was breeding and a female was holding eggs in her mouth. One fine day I noticed that one of the females in my tank was missing. Upon closer inspection, I saw her hidden under a rock. When I used a flashlight to look closely, I noticed she was holding eggs in her mouth. I was very excited and nervous at the same time. I knew I would have to wait 3-4 weeks for her to release the fry but I couldn’t let the Paracyprichromis nigripinnis males harass the Trematocara variabile group for 4 weeks. After weighing in my options, I finally decided to strip the female (taking out the eggs from female’s mouth and raising them artificially). Female holding eggs in her mouth. If you notice closely, the eggs in her mouth can be seen in this photo. Paracyprichromis nigripinnis are a maternal mouthbrooding species. They like to mate on the rock slopes. The female incubates the eggs in her mouth for about 3-4 weeks. Egg holding females mostly hide the whole time but come out during the feeding time. Many people claim that an egg holding female doesn’t eat anything while incubating the eggs in her buccal cavity but I found that statement didn’t hold true in my tank. The egg holding female in my tank would come out, grab a bloodworm and somehow manage to eat it while keeping the eggs in the mouth safe. It is amazing how transparent the skin under the jaw is. People claim that if the female is left to incubate the eggs on her own, after 3 weeks one can actually see hatched fry in her mouth. 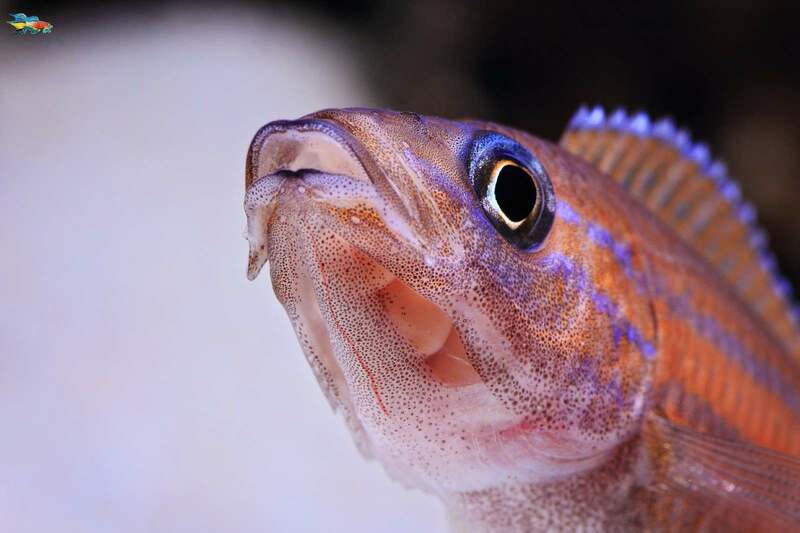 My nails were trimmed- You would notice in the video that I struggled to get a hold of the mandible or the lower jaw which would then open the protrusible mouth that Paracyprichromis nigripinnis possess. If I had to do this again, I will make sure that my nails are not freshly trimmed. I did not use a paperclip. I had read that using a paperclip helps to open the mandible or lower jaw easily. I just wasn’t sure if I could use any sort of a tool while dealing with a fish’s mouth and eggs. I just couldn’t trust my reflexes so I decided to it just with the hands. After I stripped the female and the fry were free swimming, I decided to remove all the adult Paracyprichromis nigripinnis from the tank. 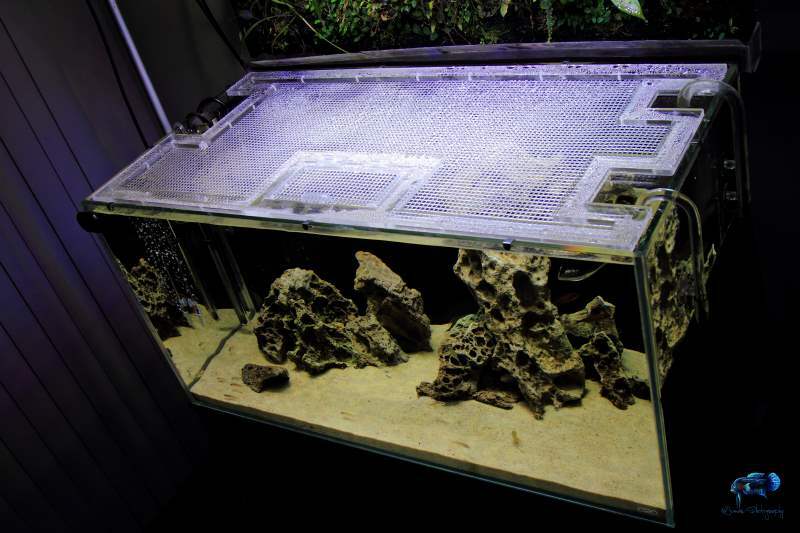 A local hobbyist gladly adopted them for his community Tanganyikan tank. I continued to rear the fry until they were about 4-5 months old. When they reached 1.5 inches in length, I gave them to another local hobbyist. I enjoyed keeping Paracyprichromis nigripinnis. I would love to keep them again in future but in a bigger tank and in a bigger group. Thanks for reading and watching the videos. As always, if you have any questions or comments, please feel free to post them below.